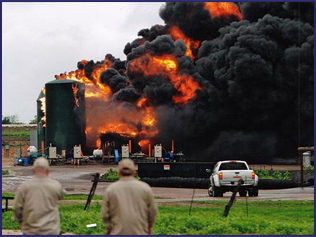 Unit Liner Secondary Containment Structure Shows Exemplary Resilience in Texas Fire. Our galvanized metal contaimnet rings are in stock and ready to ship. These solid and sturdy structures are constructed out of 12, 14 and 18 gauge metal sheets (10 gauge also available) and are the backbone of safe and reliable secondary spill containment systems. The sheets can also be color powder coated in BLM colors or your own company colors. 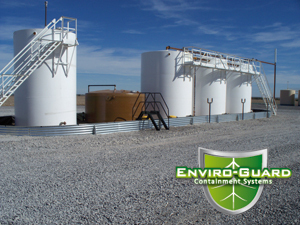 Enviro-Guard Secondary Containment Systems are G-90 Galvanized Corrugated Steel. Available in 10, 12, 14 and 18 Gauge. Containment Systems are available in 22", 25", 35", 36" and 45". Available in Powder Coated with BLM or custom colors. Liners for secondary containment units are available n flexible polyethylene, polypropylene, and 100% polyurethane spray-in liners. Oval containment structures are our most common shape containment structure. Square or rectangle containment structures are great for when you need a 90 degree corner. 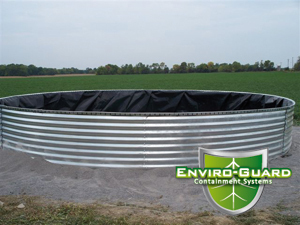 Round containment structures are ideal for single tank secondary containment. 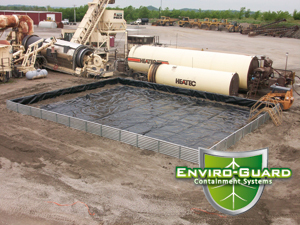 Zero ground containment structures are perfect for frozen, rocky, or very hard ground. 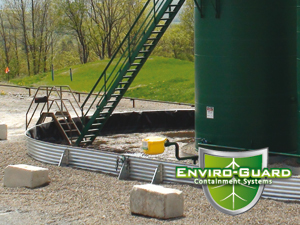 The Zero-Ground containment systems are made especially for above ground applications where underground pipe is present, the ground is too rocky, or unsuitable for gidding trenches used in traditional containment systems. With the Zero-Ground Containment systems there is no need for drilling postholes or setting post in concrete. Braces and cable are configured to support the assembled wall sections and to provide resistance against the outwardly force exerted by material that is released during a spill or when the containment fills with rain water. Our professional installation crews consider your safety procedures a top priority. Our outstanding record testifies to our commitment to work safety. To learn more about the Unit Liner commitment to safety Click Here.